Marian E. Crowe is Adjunct Assistant Professor in the Freshman Writing Program at the University of Notre Dame. 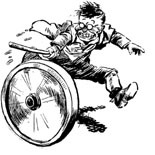 A lot of people are falling off of Chesterton’s chariot, and sometimes I think I’m the only Catholic in America who cares. I am concerned about numbers, about thinness in the ranks and those people drifting away from the Catholic Church. Is the ride too bumpy or is there no longer a destination in sight? During the decades after Vatican II, as the number of priests declined, laypeople began to move into roles formerly reserved for priests and religious. They took over religious education of the young, both in Catholic schools (as the presence of sisters became increasingly rare) and in CCD; they staffed RCIA programs, participated in Bible study and faith-sharing groups, and helped run diocesan programs, etc. Undoubtedly, they have done a great deal of good. Nevertheless, I am unpersuaded by the comfortable conviction on the part of many Catholics that this improvised situation is acceptable. I recall speaking to a young mother who taught CCD who confessed that she often felt insecure when her pupils asked her questions. She just couldn’t answer them. Of course, the response one meets with when expressing concern about this situation is to be told that CCD classes are not about information. We are there (we are told) to share our faith, to let the joy and excitement of our relationship with the Lord spill over to others. I want to argue with this point of view. I want to say that information in the form of rational, informed, and persuasive discourse is critically important. We must pass along the faith in the world of late 20th-century America, where the entertainment industry, journalism, and academia are not only highly secular, but often explicitly antireligious. Perhaps we have something to learn from evangelistic Protestants who utilize the media to spread the Gospel — information about the Gospel. Although Chesterton cultivated a streak of romanticism and delighted in excursions into fantasyland, the source and inspiration for distributism lay elsewhere.